Today I have some big news. This is my very last regular blog post! I can’t believe I’ve been writing these posts for almost a year! Since the first one explaining the new recycling system in May 2017, we’ve covered all kinds of interesting topics – from creating a home recycling centre to busting myths, from what happens to your food waste to the weirdest things we’ve found in recycling. Writing the blog and answering your questions has been genuinely fun. Thanks to everyone who’s left a comment or given me feedback – you’ve taught me a lot about blog-writing and I hope you’ve enjoyed the posts, even the ones that included awful jokes! I first started posting here when the rubbish collections changes were due to start back in June 2017. The changes got plenty of attention and we Zone Wardens were answering lots of enquiries from residents. 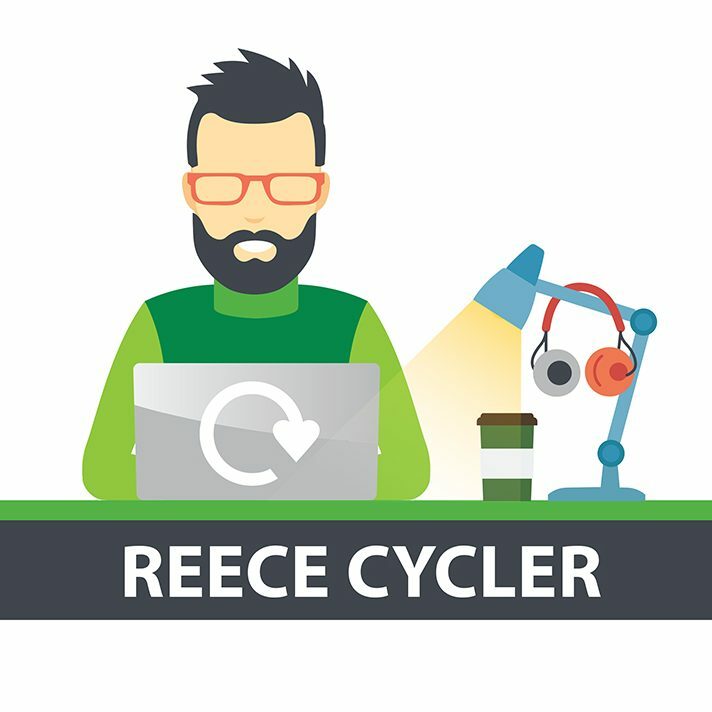 Living in Colchester, I use the recycling and rubbish service myself and figured an ‘insider’ blog might be helpful to other residents. If I’ve left you one thing with you, I hope that’s a change in the way you think about recycling – because recycling is awesome and every little bit makes a difference. Like I said, change can be a good thing… and in my opinion there’s no change better than the kind that turns something old into something new and thrilling. Whether its old household materials being recycled into aeroplane parts, or a Zone Warden finishing his blog to focus on new projects, it’s what makes the world go round. I might be back with the occasional post, but for now I’d like to wish you all the very best for the future… and happy recycling! Every year, my wife and I make grand plans for spring. Keeping a weekend clear, we list all the things we want to achieve around the house, from re-grouting the bathroom tiles to clearing out what we call the Everything Else Cupboard (the one we open very carefully, in case all the junk falls out). When the Spring Clean Weekend arrives, we’re full of motivation, imagining the beautiful, clean, well-organised home we’ll be relaxing in by Sunday evening. Of course, it never happens. The grouting takes longer than expected, the cupboard turns out to be full of souvenirs that need to be reminisced over for at least two hours, the guinea pig suddenly needs the vet and we never get as much done as we planned. 1) List all the rooms in your house on a piece of paper. 2) Note up to three things you want to achieve in each room. 3) Each weekend from now onwards, complete your tasks for one room. That’s only three jobs per weekend. Easy, right? Even if you have a big house, you should be able to get everything done during the spring using the ‘Reece Method’. 4) You’re bound to find all sorts of junk you no longer want. Put it all in a corner, and once your jobs are finished for the weekend, recycle it! Much of what you throw out may still be useful to someone else. If your family and friends don’t want it, consider donating it to a charity shop. Clean clothes, furniture, toys, ornaments, books and media are all welcomed – a quick Google search will show up your nearest charity shops and the types of donations they take. Another option is to use community Facebook pages to give things away or sell them for a small charge. We got rid of an old coffee table through our local Facebook selling page last year – it was picked up within three hours! To get as much interest as possible, include a photo of the item in your post. Your trash is someone else’s treasure – unless it’s broken, of course. Even then, it might contain important materials that can be recycled to save our planet’s resources. Small electrical items like radios, toasters and calculators can be taken to the pink bin at your local library to be recycled, even if they don’t work any more. Other waste can be taken to your nearest Essex County Council Recycling Centre – wherever you can, separate out any parts that are recyclable. It all helps! If you have anything really bulky and can’t take it to the tip yourself, the Council does offer a special collection for larger items at a small charge. You can book this via the Colchester Borough Council website. Lastly, if you’re anything like us, your house is full of the guilty evidence of empty Christmas selection tins. Don’t throw them away – they’re brilliant for tidying away smaller items like photos, receipts, screws, nail polishes, baubles… just label them so you know what’s what next time you have a spring clean! Can you believe it’s nearly Christmas? It certainly feels like it, with all the snow we had last week. Only days now until Father Christmas flies through the sky on his sleigh pulled by reindeer, bringing presents for the children of Colchester. My son was concerned that Santa might not be able to get in as we don’t have a chimney, but we’ve fixed that by making him a special decorated ‘Santa key’ from cardboard and wrapping paper scraps. Hanging it on the outside of the door means the merry gift-bringer will definitely be able to enter on Christmas Eve, and I’ve assured my son that there’s ample parking for his sleigh at the roadside. Of course, to accommodate Santa’s arrival and the bank holidays, other magical vehicles will be adjusting the day of their visits during Christmas week. I’m talking, of course, about the recycling and rubbish trucks that will come to take away all the wrapping paper, toy packaging, food waste and general evidence of our celebrations once Christmas Day and Boxing Day have passed. Lots of people have been asking me whether their schedules are changing over Christmas and the answer is yes, but only for one week. Between 25 and 30 December, all our recycling and rubbish collections are going to be one day later than usual. For example, if your normal collection day is Tuesday, your containers will be picked up on a Wednesday instead. New Year’s Day Bank Holiday won’t affect collections, so all you need to remember is to put your rubbish out a day later than usual between Boxing Day and New Year’s Eve. The order of your Green and Blue weeks will stay the same, and collections will go back to your usual day the following week. If you live in a flat with a communal collection point, your collections will return to normal from Wednesday 27 December. Wrapping paper and cracker parts can go into your clear paper recycling sack, unless it’s covered in glitter or metallic foil, in which case it should go in the black general waste. Tinfoil from turkey and roast potatoes can be rinsed and then put into your glass and cans box. Plastic trays from party food are fully recyclable and can be put into your clear plastic recycling bag. Plastic nets used to store nuts, oranges and other produce can also go into the plastics recycling. Unwanted presents might not be recyclable, but can be given to charity shops… or even re-gifted (don’t worry, I won’t tell)! Every time you recycle something this Christmas, you’re giving a gift to our planet. Did you know that recycling just one wine bottle saves enough energy to power a home stereo for 24 hours? I think that’s pretty magical. This is my last blog before Christmas – me and the other Recycling Zone Wardens will be out and about over the next week, though, so feel free to ask us your recycling-related questions, or leave me a comment! I wish you all a very merry Christmas, however you’re spending it, and a happy New Year. Some of our Christmas traditions are a bit strange, when you think about it – like bringing a tree indoors and dressing it up! It’s even stranger when you think that all those real trees have to be thrown out in January. Luckily, the wonderful people at St Helena Hospice are one step ahead and are already inviting people to register for their Colchester Treecycle scheme. For a suggested donation of £7.50, they will collect your real tree from your home on Saturday 6 January. They’ve covered postcode areas CO1 to CO9 for years and are now expanding to CO13 too. All you need to do is registerbefore noon on 4 January to receive the service. Donations go to the hospice, which supports local people with incurable illnesses and their families. I’ve already got some presents to go under my tree. On Saturday, my son came downstairs with his yearly Christmas wish list. Father Christmas and I have reviewed it, and although we agreed that he probably won’t be getting the “pet octopus” that he asked for, the rest of the Christmas shopping and wrapping has now begun! Some of his new toys involve batteries, whichI’m sure he’ll wear out pretty quickly. I prefer reusable ones – recharging saves me a trip to dispose of them and are much cheaper in the long run. Disposable batteries can’t be put in your black bin or sacks, because they’re hazardous and can leak toxic chemicals. If you have some, look for a battery container at your local library to dispose of them safely. Many supermarkets take them too. My own wishlist is much less exciting… I’m hoping for a new electric toothbrush! It might surprise you to hear that the old one, which broke recently, won’t have to go in the bin. You might not think of toasters, hair straighteners or music players as recyclable, because they contain so many different materials. However, many libraries in Essex have pink bins where you can recycle what’s called “small WEEE” (I’ll try not to make any jokes – it stands for Waste Electrical & Electronic Equipment). Everything in those bins gets dismantled and, wherever possible, used again. Electronics are full of complicated, expensive parts that can either be reused or broken up and recycled for the materials. That goes for broken Christmas lights too. The WEEE bins are only for small things that can be easily carried, but if you’ve got larger electronics, you can take them to the Recycling Centre or book a bulky collection. All this shopping and planning is putting me in the festive mood – I’m really looking forward to Christmas this year, even if it isn’t going to involve a real live octopus! How are your preparations going? Houses shining with decorations. Piles of wrapped presents. Tables (and stomachs) groaning with food. I love Christmas, but even I recognise how wasteful it can be. Me and my wife are pretty environmentally friendly, but we often let it slip at this time of year. There’s so much in the shops to tempt us, from special food to throwaway gifts, and it’s all justified spending – after all, it’s Christmas! The shops are stuffed with novelty gifts that look like an easy present solution, but do your friends and family really want train-shaped shot glasses or desktop basketball hoops? Instead of quick buys that’ll be shoved in a cupboard by New Year, give something they’ll really want. Experience days and vouchers are always well-received. If you’re good at crafts, make something they’ll treasure. For a close friend or relative, consider making your own ‘coupons’ promising them the most precious gift – your time, whether it’s a day out, control of the TV remote for an evening or a job around the house. Every Christmas the UK uses enough wrapping paper to circle the equator nine times! Make your own cards and wrapping paper from magazine pages, music sheets, old maps and so on, or give reusable gift bags. The Japanese art of Furoshiki, wrapping presents in printed fabric, is catching on in a big way – you can use a pretty scarf and make it part of the gift. If you do use paper, remember foil and glitter can’t be recycled. And keep the fronts of the cards you get – they’ll make awesome gift tags next year. There’s nothing festive about plastic bags, no matter how bright and jolly they look – they are terrible for the environment. When you go Christmas shopping, take your own bags. If you forget, you can put purchases from different shops in the first bag you’re given, instead of collecting new ones each time. Some shops also now offer e-receipts, which save paper, are harder to lose and easier to find. If you’re having multiple groups of friends and family over, try to plan things so you don’t buy too much food. We’re having a roast turkey on Christmas Day. I know there’s going to be lots left over, so I’m also buying part-baked rolls and having friends over for turkey sandwich lunch on Boxing Day. We’ve stocked up on plastic containers too, so we’re ready to freeze lots of roast potatoes and turkey-based dishes… looking forward to a stress-free, budget-friendly New Year with all that delicious ready-made food just waiting to be snaffled straight from the freezer! None of that looks too difficult to me. I’m looking forward to reaching New Years’ Day with a full freezer, a happy bank account and no guilty conscience this year! If you’re joining in, leave a comment letting me know how you get on… I’d love to hear any tips you have!